Today virtually all urban transit is operated by government bodies. However, at the turn of the century all transit lines were privately owned. At that time the concept of government ownership was a very radical idea, positively subversive. The very first municipally owned and operated transit system in a large city in the United States was the Municipal Railway in San Francisco. A change in the city charter in 1900 authorized municipal ownership. A bond issue was approved in a special election in 1909. Construction started in 1911 and service began at the end of 1912. The public sector had been involved in transit before 1912. The New York City subways were built by the city but operated by private companies. An experiment in Cleveland with municipal operation of privately owned lines ended in bankruptcy. The idea of municipal ownership spread slowly. The city of Detroit bought out the private streetcar company in 1922. Perhaps the smallest municipal system was the Fort Collins (Colorado) Municipal Railway which operated a three streetcar system until 1951. Here in California the Eureka Municipal Railway operated streetcars until 1940. San Francisco was not able to buy the competing privately owned Market Street Railway until 1944. The Muni monopoly became complete in 1951 when it purchased the bankrupt California Street Cable Railroad. Today, the San Francisco Municipal Railway (SF Muni or Muni) is the public transit system for the city and county of San Francisco, California. In ridership Muni is the seventh largest transit system in the United States. Muni is an integral part of public transit in the city of San Francisco, operating 365 days a year and connecting with regional transportation services, such as Bay Area Rapid Transit (BART), Caltrain, SamTrans, Golden Gate Transit, and AC Transit. Its network consists of 54 bus lines, 17 trolley bus lines, 7 light rail lines that operate above ground and in the city's lone subway tube (called Muni Metro), 3 cable car lines, and a heritage streetcar line known as the F Market & Wharves. Many weekday riders are commuters, as the daytime weekday population in San Francisco exceeds its normal residential population. Muni shares four metro stations with BART. Travelers can connect to San Francisco International Airport and Oakland International Airport via BART. 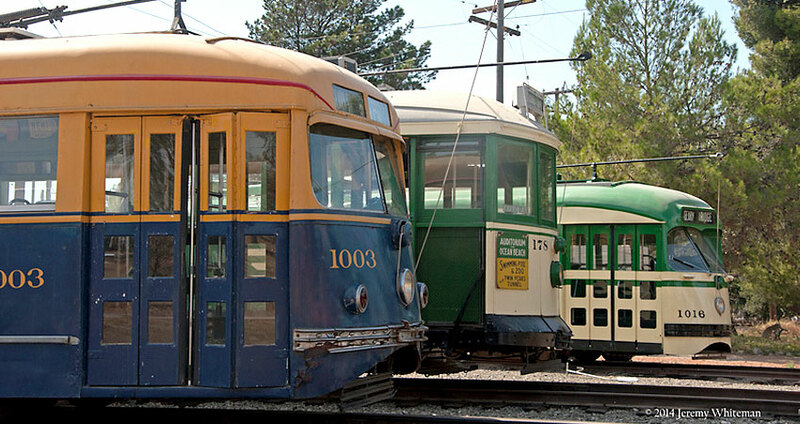 The Western Railway Museum’s collection of MUNI equipment includes cars built from 1901 to 1978.